FREE Mindful Living Masterclass: Nine To Shine Mindset Challenge! Register now to enroll in my next FREE Mindful Living masterclass + to access your free 9-step roadmap to help you de-stress for success. I offer 4 digital courses to help you destress for success and become the person everyone loves (including yourself)! This free masterclass is the perfect kickstarter to help you make your goals and dreams a reality without all the overwhelm. In 9 days with 9 steps you will learn practical tools to apply in your everyday life and begin making a positive impact in life, family, and career. ~ Mindful Living 101: How to Become the Person Everyone Loves (including yourself)! This digital course takes a deeper dive into the content covered in the free masterclass. You will get more in depth content + additional support and resources on living and creating a life you love. ~ Mindful Parenting Academy: How To Become a Parent Your Kids Love (and so do you)! This digital course is for pro-active parents ready to make a positive and lasting difference in their families and community. ~ Mindfulness Education University: A Step-By-Step Guide to Creating a Classroom Environment Everyone Loves! If you are interested in a live professional development training at your school please visit my Teachers/Training for additional details + free resources just for educators! Are you a natural leader on your campus ready to make a positive and lasting impact in the lives of your students and colleagues? I developed this mindfulness-based social and emotional learning certification program just for you. With exclusive benefits, resources, and personal coaching support you don’t want to miss this opportunity to grow your educator skill set and advance your career in a growing industry! After our initial consultation, I schedule one-on-one sessions in groups of 3 sessions. This ensures practicality, consistency, and predictability. If you looking for a more hands-on, personalized, and tailored yoga, mindfulness, and health + wellness sessions, contact me to reserve your spot today. I have limited space for private sessions for adults, youth, and/or families. Prices vary depending on size and each client’s unique requests/needs. Transform your life with my Five Pillars to Peace. 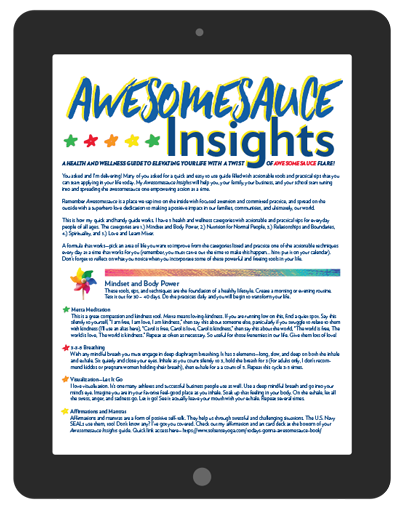 Download your FREE health and wellness guide now - Awesomesauce Insights! As a new Sol Sense member you will receive exclusive mindfully-infused insights, information and inspiration each week to help you and yours shine bright!